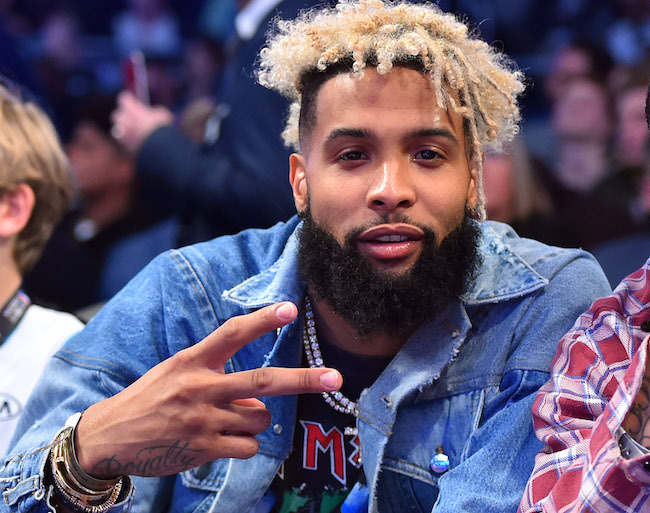 Conflicting media sources are reporting that the New York Giants are and are not fielding trade offers for Odell Beckham, Jr., the supremely-talented wide receiver who also has a knack for generating off-the-field controversy. Beckham is entering the last year of his rookie contract with $8,459,000 in salary. There have been unverified reports that Beckham intends to holdout until he receives an extremely lucrative contract extension. The NFL Network is reporting that while the Giants are listening to offers from several teams, it is not clear that the Giants actually want to trade Beckham. At the NFL Annual Meeting on Tuesday, Head Coach Pat Shurmur said he spoke with Beckham in California last week. “We just got an opportunity to sit down and talk,” Shurmur said. “I had a chance to share my thoughts on all topics Odell, other than football certainly, and it was a good visit. He showed me his favorite restaurants in town and we just got a chance to get to know one another. He’s a very charismatic guy, I think he really cares and I’m looking forward to working with him… We all understand this time of year (due to League rules) you can’t talk football, but there was a good meeting and I felt like I got to know him a little better. Again, the only way you get to know somebody is by visiting with them, and I got a good sense or a little better sense of who he is. “I’ve got a good radar on people. I’ve got a good radar on what’s going on this morning here. I think that’s why it’s important as coaches and players and anybody that is working together that you get a chance to visit and get to know one another. I really don’t think you can know somebody by just seeing reports, reading reports, hearing what people think and say. I think it’s really important, especially in the player-coach relationship, that I get to know him. The Giants’ offseason program begins on April 9th. Beckham is coming off a serious ankle injury that he suffered last October and which required surgery. General Manager Dave Gettleman also addressed the media at the NFL Annual Meeting on Tuesday. “I just want to make a couple comments and, please, I’m not talking down on anybody,” Gettleman said. “There are 53 guys on every active NFL roster. Football is the ultimate team game – 11 guys go out there, they blow the whistle, if you’re the defense and 10 guys do it right and one guy does it wrong, you’re looking at a touchdown. Same thing on the other side of the ball, and same thing on special teams. It is the ultimate team game. “Every decision we make will be in the best interest of the New York Football Giants. I want you guys to understand something, I’m not going to discuss any aspects of contracts, I’m not going to talk timelines, I’m not going to talk progress. I’m not going there. I didn’t do it in Carolina and I ain’t doing it up here, plain and simple. One of the most important responsibilities that any GM has is to eliminate internal and external distractions. It’s my responsibility to create the atmosphere that allows players to play and coaches to coach. That is part of my job, and I really believe that. The other thing that I want you to understand is I’m not going to respond to hypotheticals, I’m telling you right now. Gettleman was asked about a controversial video of Beckham that circulated recently on social media. Gettleman was then asked if he wants Beckham on his team. 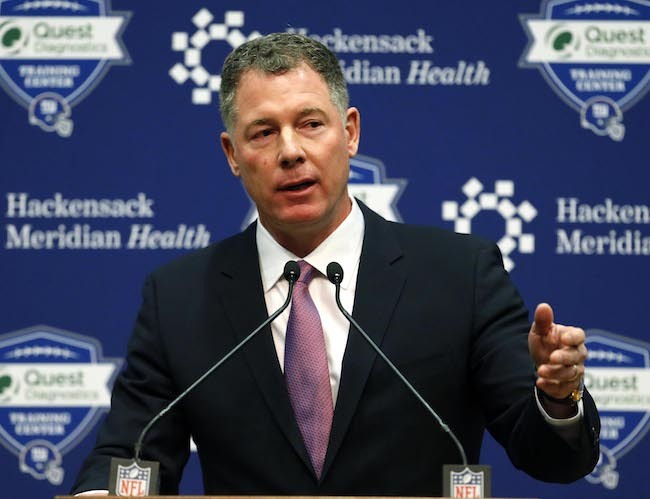 Pat Shurmur was officially introduced as the new head coach of the New York Giants at press conference on Friday at the Quest Diagnostics Training Center in East Rutherford, New Jersey. 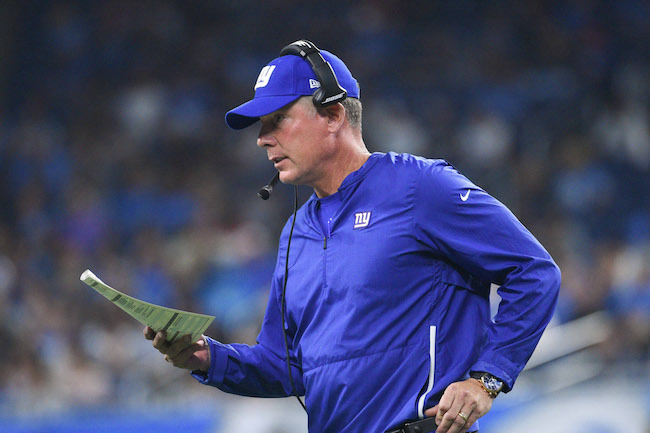 Shurmur’s contract is reportedly a 5-year deal, running through the 2019 NFL season. Good morning. As soon as our season ended, Steve Tisch, Dave Gettleman, Kevin Abrams and myself started this process of finding and identifying our new head coach. We were looking for someone with intelligence, leadership skills, a presence, a professional demeanor, and the right philosophy on how to build a team. It did not matter to any of us whether it was an offensive or a defensive coach. We did a considerable amount of research, which included speaking with executives and coaches, past and present, around the NFL, and players, as well. We were able to identify some great candidates, but it struck me that the name that constantly came up with just about everybody that we talked to was Pat Shurmur. We had some very impressive interviews with six different coaches. We had much discussion back and forth about each of these individuals. We did some more research, and we ultimately decided that Pat was the right man for this job. Pat has had considerable success as an offensive coordinator. He’s had prior experience as a head coach. He’s worked under some great coaches. He has an impressive record in developing young players, particularly quarterbacks, and he’s got an excellent track record as a play caller. And he’s very well‑respected by the players that he’s coached in the past. It also became apparent to us very early on that Pat and Dave share a similar philosophy in how to build a team, and that was no small factor in this decision. So in sum, he checked all of the boxes for us. For all of these reasons, we believe that he is the right coach at the right time for this franchise. So now, on behalf of the Tisch and Mara families, it is my pleasure and honor to introduce the new head coach of the New York Giants, Pat Shurmur. First, I’d like to thank John Mara; I’d like to thank Steve Tisch. I just met Jon and Laurie. I’d like to thank Dave Gettleman, Kevin Abrams. It’s an honor and a privilege to be the head coach of the New York Giants. As I mentioned recently, and I think it happened in one of the earlier articles, this is an iconic franchise. I understand most of the history. I walked by four Super Bowl trophies. As we go forward here, I’m looking forward to leading this organization, and I want to be the coach. I understand the responsibility that comes with being the coach. I’m taking over a team that was 3‑13, so we’ve got to own that. There’s a lot of work to be done. There’s changes that need to be made. But running parallel with this press conference, I’m hiring a staff of guys that will help us get to where we need to be, and I think that’s the important piece. I’d like to thank some other people. My wife Jennifer is here. We’ve been married for 27‑and‑a‑half years. She’s the strength of our family. She’s actually an East Coast girl. She grew up in Poughkeepsie. Her father was a Giants fan growing up in Waterbury, her mom was from New York, so this is somewhat of a homecoming, and she really is the strength of our family. We have four children. Our daughters are here today. And they cry a lot. Anyway, so I have ‑‑ I’m crying because I’ve got three weddings on the horizon at some point, and they won’t be in a K of C hall. Anyway, our three daughters are here today. We have four children: Allyson and Erica, who live in Philadelphia, so they’re going to fight our battles on away turf. They live in Philly and we are very proud of them. Our daughter Claire is here, as well. She’s a freshman, will be a sophomore next year, and then our son Kyle is back in Nashville. He plays quarterback at Vanderbilt. They’re terrific kids. They’ve made great choices. They’ve spent their senior years in different towns; give plenty of free advice. ‘Dad, if the quarterback played better, we’d have won; that play where you hand the ball off and run it up the center, I don’t like that play.’ A lot of free advice, but much more unconditional love. I’d like to thank my mom back in Michigan. My mom and dad did a heck of a job raising us. They taught us how to compete. They taught us how to have compassion. They taught us how not to let anybody tell you that you can’t do something. And so, I appreciate them and love them. I’d like to thank the Minnesota Vikings. We went there two years ago and quickly became very close to the people up there. Mark and Zygi Wilf, obviously Kevin Warren, Rob Brzezinski, George Paton, and then certainly along the way Rick Spielman and Mike Zimmer. They are an outstanding organization. I want to thank the players, as well. They are an old‑school operation with an eye on the future, and they do it right. And if we’re going to get to where we need to be, at some point we’re going to have to play them and beat them. So that’ll be a challenge for us. Now regarding me, you have hired a career coach. You’ve hired a guy that doesn’t know what he would do if he wasn’t doing this. You’ve hired a guy that wants every day to interact with the staff, the coaches, the players, and I really do feel like my role is to make everybody as good as they can be. And I think if we do that on a day‑to‑day basis, we’ll get to where we want to be, and that’s re-establish the winning tradition and put ourselves in a position to win championships. And I understand that’s a journey. You’re going to try to all figure out who I am. Some would say I’m a little serious. Alright, I get that. But I do think this is a serious business. It’s played and coached by adults. We just happen to do it with a young person’s enthusiasm, and I think that’s important. Some will tell you I have a healthy sense of humor. Those are the people that know me. I’m okay laughing at myself, and I own all that. Most people will tell you that I’m competitive and gritty, and that’s the overachiever’s mindset in me. I feel like we don’t know it all, and I look forward to learning something new every day. Those of you that do know me, though, I have zero tolerance for people that don’t compete. I have zero tolerance for people that don’t give effort, and I have zero tolerance for people that show a lack of respect. And I think that’s something that you’ll know about me as we get to know each other better. But the people and the players that know me know that I’m willing to give them a hug at the end of a hard day. That’s a little bit about me. I can’t wait to get going. As you know, we’re in the process of hiring a staff. Some of those names are public, so I have no problem commenting on that. As we put the staff together, we’ll try to get you that information in a timely way. And I learned in my last shot at being a head coach, information travels off your thumbs very quickly, and we as coaches needed to learn ‑‑ in the old handbook it was, ‘Say nothing and be very guarded.’ I don’t feel like that’s necessary anymore. So I’ll try to answer your questions. Unfortunately, the answer to a question might be, ‘It’s between me and the player’, and then you can find out what the player thinks; know what I mean? So I get that. But I’ll try to be open. We’ll try to answer your questions in really any situation, except for those things that involve Giants’ business that make no sense to be public. That being said, certainly thrilled to be here, and I’m certainly thrilled to lead our organization back to the path of winning. With that, I’ll take your questions. Q: What did you learn in your first stop (as a head coach) that makes you feel you’re better equipped to be in this spot the second time around? A: Good question. I mentioned this one before, too. Everything Cleveland, I wish I knew then what I know now. I think when you’re doing anything for the first time, there’s things that happen that you adjust to that if you’ve done them before, and I’m being a little bit vague here. Some of it’s really not specific. But obviously once you’ve done it before, you have the resources, and you’ve made those decisions. You’ve made those calls. You’ve done the things that you say if I do that again, I’ll never do that again. And I think I learned that. Q: What do you think your relationship with Eli Manning will be, and in the interview process how strongly were you saying, ‘I want this 37‑year‑old quarterback to be back here’? A: Well, first off, I think the relationship is going to be very strong. I’ve watched him, competed against him, admired how he’s played over the years. Got to spend some time with him this summer in the Manning Academy setting. I’ve already spoken to him on the phone and he’s an outstanding football player, and I can’t wait to get to work with him. I’ve admired the way he’s handled things. I sort of like a calm approach to the position. Looking forward to getting to work with him. Q: How do you win that locker room? How do you get that locker room playing for you, playing hard? A: Yeah, with regard to the players, I really do believe it’s about the players. We used to have a thing we said in Philadelphia, and then certainly when we went to Minnesota that, ‘It’s not the plays, it’s the players.’ I think what’s important is we’re going to establish the right way to do things. We’re going to establish what we want as a New York Giants football team. And what we’re going to do is we’re going to inspire the players to see it our way, and I think that’s an important thing. There’s reasons why the Giants slipped to 3‑13, and we’re going to find out what some of those reasons are behind the scenes, and we’re going to try to get them fixed at the beginning. Now, I will say this: When it comes to coaching and playing, you work together, and I think what’s important is we establish at the very beginning the way we’re going to do things, what we expect, and then keep talking about why it’s important so that they believe it, as well. Q: Are you planning to call the plays? A: I do plan to call the plays, yes. Q: What’s your plan offensive coordinator wise? A: That’s a little bit behind the scenes right now. I’m not avoiding that. That’s a work in progress. But I’m going to hire ‑‑ with regard to all of our coaches ‑‑ here’s what I was looking for and some of them are here in the building. There’s not six or seven guys becoming head coaches every year, and I don’t think you need to sweep the whole place clean. There’s some really good coaches here, and I want to first keep them. There’s other guys we’re looking at outside the building that are, number one, career coaches, outstanding teachers, communicators, and so we’re looking for those type people. Some of them are currently not quite available, but we’ll make sure we get a staff full of guys that can inspire our players. Q: I know you’ve been to Mobile, but how much have you looked at film of Eli Manning and Odell when he was healthy and really start studying this offense, and Davis Webb as well? A: Yeah, I’m very familiar with the offense, very familiar with the players, and again, I look forward to visiting with them. Certainly this time of year we can’t talk schematics, but I’m looking forward to once we get through today, really getting a chance to get to know the players. I think what’s important is, you know, we’re all sort of what we believe and what our experiences tell us, and so I think what’s important when you’re talking with players that have had success, sit down and start to communicate – here’s the things that they did well, here’s the things that I believe in, and let’s do the things that work best for us. And so that’s going to be the process as I go through with all the players. Q: When you look at this team last year at 3‑13, do you still see a lot of talent there? A lot of the same players returning from the 11‑5 year the year before. Or a lack of talent, or was it other issues that caused it? A: Well, I think we’ll get into whether there were other issues. There are a lot of very talented players on this team. I think every team has that. And then every team goes through seasons. A year ago in Minnesota we had a lot of injuries, and again, they didn’t become part of the daily conversation, but we found our way to be 8‑8, dealing with a lot of adversity. This year we won 14, and we made some changes, although they may not have seemed to be big changes, that can do that. Now, I’m not saying that’s what’s going to happen in a year, but I do know this: Every year is different. Every year you have new players. You have new coaches. And the challenge is then when we get going here the first part of April is we work together to put together a team that has the chemistry to go out and compete and win, so that’s what we’re looking to do. Q: What is your evaluation, following up on the Eli questions, about where Eli is at in his career, how much he might have left, and how that would factor into what might be done with the second pick in the draft? A: Yeah, I think those are all questions for down the road. I’m sure we’ll talk about that up until the draft. You know, I watched Eli throw a little bit this summer, and I walked away saying, ‘He looked really, really good.’ He looked fit. He was throwing the ball well. The ball had good velocity coming off his hand. And again, I think he’s got years left. How much, I don’t know. But I think he has time left, and I look forward to working with him. With regard to who we’re going to draft, you know, I’m not ducking that question. I think that we’ve got to travel down that road of evaluation to see what happens there. But I think what’s important is we have a guy here that’s helped this organization win Super Bowls. He’s an outstanding player, and I’m really looking forward to working with him. Q: I’m just wondering if you’ve given some thought to the type of identity, the type of culture you want to build within the locker room. A: Yeah, I think what’s important, and I alluded to it, we need to have a tough, gritty team that knows how to compete. I think what’s important is when we put the roster together, we want to first accumulate 90 players that love to play football. Now, certainly they’re going to have to have the skill and ability to do it, but we want to put together a group of 90 and then eventually get to 53. I think sometimes the good answer for a young player is, ‘I really don’t know what I’d do if I didn’t have this game.’ And I think it’s the absolute greatest game in the world. And so we need to find guys that love to play the game, and then we’ll decide whether they’re good enough, and then we’ll take it from there. Q: I was wondering if you could talk a little bit about your defensive coordinator James Bettcher and what you think he’s going to bring to the team. A: Yeah, I’ve known James for a while, and I think he’s a rising star in the profession. He’s played ‑‑ they’ve played outstanding defense in Arizona for a very long time. He’s a little bit multiple in his scheme, which I think is good. Everyone I’ve talked to, he inspires the player. He’s got a great presence, and we’re really, really fortunate to have him be with us. Very hard to score against. They find a way to put pressure on the quarterback. They do a good job in their coverage schemes, and they’ve been good at stopping the run. He’s had a top‑six defense the last three years, and for whatever reason on the teams I’ve been on, I’ve crossed over against them. Q: You say he’s multiple in his schemes. Do you envision more of a three‑man front here? A: I think that’s talked about often, three‑man front, five on the line, four‑man front. I think all defenses play a version of that throughout the game. Even teams that play five on the line, you know, they’re in nickel 60 percent of the time, so it’s a four‑man front. So the ability to be multiple in my opinion, as long as you can still remain fundamental, is something that’s hard on an offense, and I’ve faced that through the years. Q: What would you say to a Giants’ fan base that isn’t disappointed with the past season, it’s furious and expects a quick turnaround? A: I get furious. I get quick turnaround. I do know that what’s important is we get better every day. With regard to players, if each player swaps, so to speak, makes us incrementally better, that’s what we’re looking to do. You know, you eat an elephant one bite at a time. So we’re going to do that. And I think what’s important is we just every day work toward where we need to be. Then it won’t be a three‑pointer at the buzzer. Then we will have established a team that can sustain that over time. Q: Do you have a philosophy at all in dealing with a locker room where probably a result of the losing was the in‑fighting, the back‑biting, the players not getting along and that becoming public here? A: Yeah, I think ‑‑ well, first off, I admire how resourceful people are at getting information, so I don’t really believe there’s any secrets. Okay, so I think what you do is you start initially with the locker room by developing relationships with those guys that love to play football, and you’re constantly talking to them about what it means to be a good pro. For a receiver to be a good pro sometimes is even though you’re frustrated that you didn’t get the ball, you’ve got to make sure you keep that in check. Or for whatever reason. Maybe you’re a defensive lineman that’s not getting as many sacks. They need to understand that the pressure you’re putting on the quarterback, even though you didn’t sack him, is just as important. Two quick examples of being able to just constantly communicate with the players. We as coaches are educators. We work with the players, and it’s important that we inspire them to play their very best. And some of that is going and talking about those types of issues. Q: We talk about Odell Beckham Jr., here, and the role he has in this offense. I know you have a previous relationship with Eli. Do you have a previous relationship with Odell? Have you had a chance to talk to him yet, and what do you envision for him in your offense? A: Well, he’s a tremendous player. I went through the evaluation process at the time I was in Philadelphia and he was high on our draft board. We loved him as a player, and really pre‑draft stuff, we loved everything about him. I’ve watched him play and compete, and when you throw all the other stuff out and you watch him on the field, he’s outstanding. So it makes sense to throw him the football. I’m just going to say that right away. If I didn’t acknowledge that, then you’ve definitely got the wrong guy up here. But I think what needs to happen now is I need to get to know him. I need to get to know what makes him tick, and I get to ‑‑ I need to talk to him about what it is that we’re looking for for a guy that plays for the New York Giants. And I think those are the things that go back to relationship building that need to happen very, very soon. 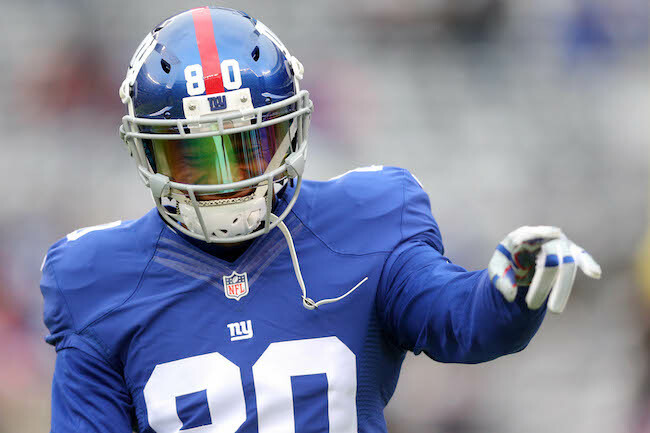 Q: John Mara mentioned that you and Dave Gettleman have kind of a similar philosophy how to build a team, and when you were sitting in that interview, as the Giants were saying, ‘This could be our guy’, what were you saying, specifically talking to Gettleman about building a team, what made you say, ‘This is for me’? A: As soon as he said, ‘Everything starts with the offensive line.’ And I think there’s a great example of that, what we went through in Minnesota. We didn’t change the oil up there, we changed the transmission. We went and got two free agent offensive linemen, we drafted a center that played like a veteran, and we transformed the offensive line that helped us do the things that helped us win 14 games. And so I think it’s very important, no matter how good your offensive line is and your defensive line, you have to address those issues constantly because if you can’t block them and you can’t pressure the quarterback, this game gets really, really, really hard. I know that about Dave. I know we have a serious mindset when it comes to doing what we can to upgrade in those areas. And some of it may be just inspiring a player on the roster to play better than he’s played, you know, and that comes back to coaching. And then we all know that every once in a while, you need to get some new players. Q: What’s your first priority here, first couple priorities once you’re done here today? A: Well, there’s a lot kind of running parallel right now. I certainly want to get a feel for the passion in the building. I came in yesterday, and I had an opportunity to walk around the building. There’s a lot of people here that when you shake their hand, you know that they’re fully committed to us winning. So keep that going. We’re certainly in the process of putting our staff together, and then we’re also running parallel with that. The player evaluation phase as well as the player acquisition phase, which is free agency and the draft. All that runs parallel. Once I get the full staff in place, then we’ll start talking about our scheme behind the scenes, and believe it or not, there’s a lot that goes on, and we’re just a few weeks behind that. Q: Did you look at this as inevitable becoming a head coach again, or did something spark interest again this season? A: What I learned about life is nothing is inevitable, and there’s no use planning for it. But I’m thrilled to be here. I feel much more prepared to do this than the first time around. And again, I try to learn something new every day, and I’m learning something about this situation that will help me as we get our team ready to play. Q: Am I correct that in Cleveland you called the plays the first year and turned it over the second year? A: Yeah, but I was still involved the second year, as well. Q. Is there anything concern about the head coach with this look (holding play sheet in front of face), not seeing? A: What look is that? Q: You know, having that play sheet in front of you and not being involved with the whole thing. A: No, not at all. I think when you put a staff together, there’s people upstairs ‑‑ there’s constant communication ‑‑ the reason we wear headsets is we’re talking to each other, and if it was just the head coach and nobody else, then I would say, yeah, that’s tough. But the way that we’re going to put the staff together, there’s constant communication, and we’ll have experienced people in all the roles necessary. It’s been done before. You see teams around the league doing it. Why guys do it and then eventually give it up or whatever, that’s their decision. You know, it’s football. Q: Is there anything that intimidates you about coaching this hallowed franchise or working in this number 1 media market? A: No, I’m not intimidated. I’m only ‑‑ I would say this: The only thing that frightens me is anything that affects the health and welfare of my kids and family. Other than that, have at it. I’m ready to go. Q: Most people when they look at the Giants, all they care about is ‘Are they getting back to the playoffs, when is it happening’, or are you just going into this year saying, ‘Let’s be competitive again and we’ll take it from there’? A: Like I said, we’re going to do what we can to get better each day, and how fast that happens, I’m as impatient as the fans, and I understand that. But we’re going to try to get better each day. As I mentioned, we have a lot of really good players on this team. We’re going to get some new ones, and we’re going to try to put together a team that can go out next year and win games. Q: You mentioned throwing out all the other stuff. When it comes to Odell that hasn’t been easy. How will you handle a player whose behavior hasn’t always reflected positively on the organization? A: Yeah, well, this is sort of a clean slate deal right now. As I mentioned, we need to sit down and talk. When things happen, there’s typically reasons for it. I learned that by coaching the quarterback. You know, I was ‑‑ I’ve said this, I’m at peace with a wide range of emotions, and so when you coach other positions, you can kind of fly off the handle and that sort of works. With a quarterback you’ve got to constantly keep saying to him, and this helped me when I started coaching quarterbacks, what did you see, why did you do that; all right, let’s talk about it. And I think with all things Odell, we just need to start talking and find out why things happened, and if they’re not what is by our standards, then we’ve got to find a way to get him fixed. Q: How do you envision the offense that ‑‑ how would you describe the offense that you’re bringing in? You have a West Coast background, but you’ve obviously ‑‑ how would you describe your own offense? A: I don’t know, we were a top‑10 offense this year. I think we have an offense that we’re going to constantly try to do the things that our players can do well. So once we quickly learn what our players are good at, then we’ll ‑‑ but I do have a West Coast background. My last three years in Philadelphia, I was with Chip Kelly, and so the tempo and being able to play fast, there’s advantages to using that strategically. When you can run the ball like we did this year, and we developed a core set of runs, then the play actions are meaningful and that’s how you can drive the ball down the field. So try to use all those things. And then when they’re trying to destroy our quarterback, certainly the screen game is something that’s very important. So I don’t know. I don’t know if there’s a label for it. We want to play good offense. We want to play New York Giants offense. Q: You seem to be smitten with Eli. What were your thoughts about Davis Webb when he was eligible? A: Yeah, good question, Davis Webb. We went through the process on Davis Webb, and we thought he was an outstanding player. We liked how competitive he was. He’s got size. He’s got good arm strength. We felt like he was a guy worthy of being drafted and having a chance to be a starter someday. Again, beyond that, I don’t know much about him. There isn’t much tape out there on him that I was able to see, and so he’s another player that I’m looking forward to getting to know. The transcript of team Chairman and Executive Vice President Steve Tisch’s post-introductory press conference remarks is available in The Corner Forum. The video is available at Giants.com. The transcript of General Manager Dave Gettleman’s conference call with the media is available in The Corner Forum. 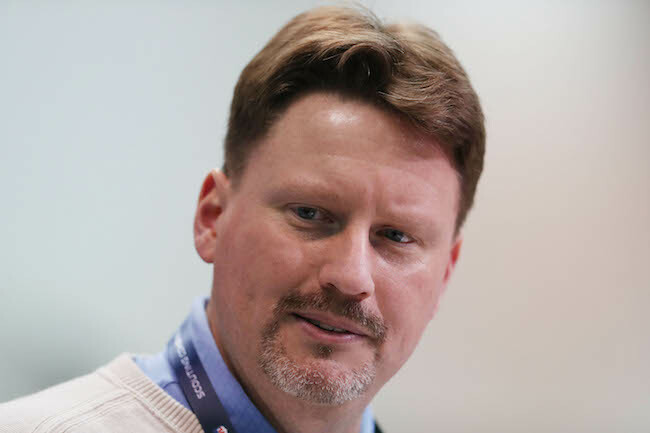 McAdoo: Alright, McAdoo here. On the offensive side of the ball, I thought we were physical and heavy-handed in the run game. Our quarterback rating and completion percentage was high and the two-minute drive in the fourth quarter showed some grit, showed that we had some fight in us. There were three fourth down conversations on that drive alone. What we need to work on, ball security in the green zone. Got to maintain possession of the ball. We got to score some points there. Third down conversions, need a higher percentage. Pass protection is a part of it, but not all of it. And we had three pre-snap penalties in the ballgame. Defensively what we did well, we created two turnovers, had a fourth down stop and played good red zone defense. What we need to work on, explosive play production, we need to keep it down, we need to be better on third down and we need to do our job and not press. The other thing that showed up is the way we finish. We have the knowledge to do what we’re asking the players to do, we have the skillsets, we felt like we put a good plan in place, I felt like we put a good plan in place. We looked good in practice all week whether it was building the wall, setting the edge, and tracking the hip. Our alignment, gap control, eye discipline, we have the knowledge and skillsets to do that. The thing that was disappointing that showed up on film is the desire to finish on a consistent basis. There were plays we were capable of making and the desire to finish wasn’t consistent. I need to coach them better and we need to do it better. Not every play, not every player, but it did show up on tape. Special teams, kickoff return, our blocking improved. Punt team, our pocket was deeper than last week. We need to work on the width. Our kicker Aldrick (Rosas), needs to play the way he practices. We need to make field goals when we get down into the red zone. We can’t start the game kicking the ball out of bounds or kick the ball out of bounds on a kickoff, period. Where do we go from here, we’re disappointed, but determined. We’re all in this thing together as coaches, as players and I’m not here to throw anyone under the bus today whether it’s a coach, whether it’s a player. We are looking forward to the opportunity on Sunday to play at home at one o’clock against one of the best teams in football. So with that, we’ll open it up. Q: What does it mean to you that ownership released a statement saying that you would be the head coach for the rest of the season? A: I’m in the process of finishing up grading the film from the last ballgame and starting on the next one. That’s where my focus is right now. Working to find a way to get the team better and coach the team better and put us in position to win at home, get our first home win of the year. Q: Do you think that having ownership on your side will help you prepare the team and get wins this year? A: I don’t know. Only time will tell. We’ll have to see how everybody responds, but again, my focus is as it always is. It’s on the week of preparation and trying to put a good plan together and help these coaches and players in any way I can putting a good product on the field and finding a way to get better. Q: If a player isn’t going to show desire to finish, why put him back on the field? A: That’s something that we’re taking a look at. We have a 46-man roster on game day and the players who are going to go out and do it the way we ask them to do it and do it on a consistent basis, they’re going to get a chance to play. Q: How much is that something you have seen before or is this a new thing? A: It’s something that in yesterday’s game, it’s fresh in my head watching the ballgame. It’s not one player and it’s not on all plays. It’s something that almost looks like at times we’re waiting for someone else to make a play instead of just pulling the trigger and making the play ourselves. Q: Do you feel like the players are listening and comprehending the motivational messages that you and the coaches are giving to them? A: Yeah, I felt that yesterday going into the ballgame, I felt we had a good, strong plan. I thought that the players were into it. After the game, which is tough to lose a ballgame, when we brought the players up at the end of the game, I felt like I had all of their eyes, I felt like they were responding, I felt like they were hurting. A lot goes into it. They put a lot of effort and a lot of energy into it, as do the coaches and I felt that disappointment. Q: Have you gone to the players who weren’t consistent and have a conversation with them or do you let everything develop organically? A: I try to make my way through the roster each and every week as best as I can. You try to build relationships with these players as best as you can. Again, I’m going to keep all personal conversations personal and private so it’s best that way. Q: Is this something you have to be more mindful of going forward in games? If you don’t see good effort in film, you can’t go back in time and get them off the field. A: Yeah, don’t put words in my mouth. I didn’t say that. I felt the desire to finish needs to get better. That needs to show up on a more consistent basis. We were in positions to make plays, our desire to finish needs to be consistent. Q: What did you see from Janoris Jenkins? A: Give me an example. What are you looking for? Q: There were a couple plays where he didn’t look like he was very willing to tackle. A: I think he got caught up on a big body there. He needs to find a way to get the big body on the ground. Q: Were you okay with his effort? A: Like I said, there were some players in the ballgame who need to show a consistent desire to finish better. I think the post ball in the game on third down is a tough play and a tough spot for him to be in against a player who has tremendous speed. And they’re going to make some plays on you. He had an opportunity on third down where he slipped, he could have came up and had a chance to pick the ball off if he had his footing there, I expect him to make that play and pick the ball off. It was unfortunate there. There were some opportunities on some balls on the perimeter where his desire to finish consistently needs to show up and we need to get the guys on the ground. We need to tackle better as a defensive unit and he was a part of it. Q: Jonathan Casillas said on that third down play that he was giving his full effort, but he said he was tired and he couldn’t keep up. Is that something that you don’t like hearing as a coach or would you rather him say that than there wasn’t desire there? A: If you are honest, you don’t have to remember anything. Jonathan is a guy that hasn’t played a lot of football as of late and this time of year practice reps are tough to come by. I haven’t had a chance to talk to him about it at this point. Q: Have some of the players disappointed you with their drop in performance from last season? A: Like I said earlier, I’m disappointed, but I’m determined to find a way to get it fixed. That’s where my focus is. No one expected our record to be what it is at this point and us to be playing the type of football that we’re playing at this point. But we are, and we are what our record says we are, and the film reflects it. We need to find a way to improve. 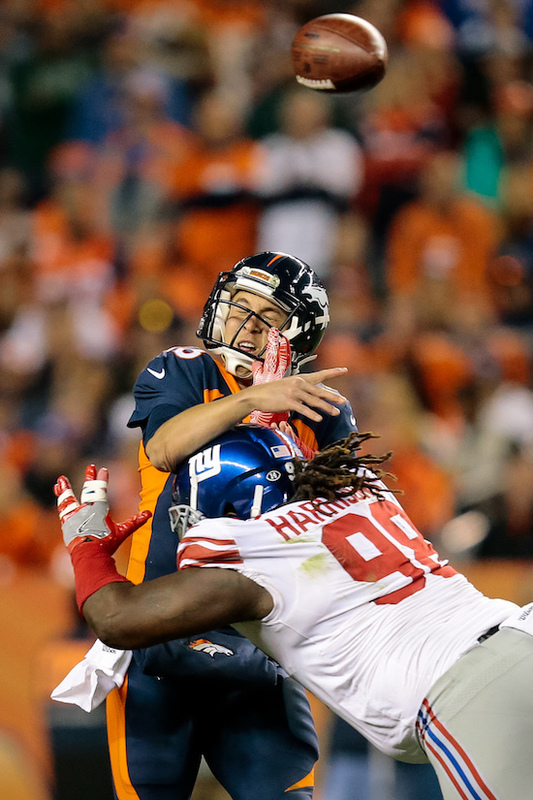 Q: How bad is Damon Harrison’s ankle injury? A: He’s still down there getting evaluated at this point. Again, it’s tough to say on a Monday. I would expect him to be limited in practice this week. 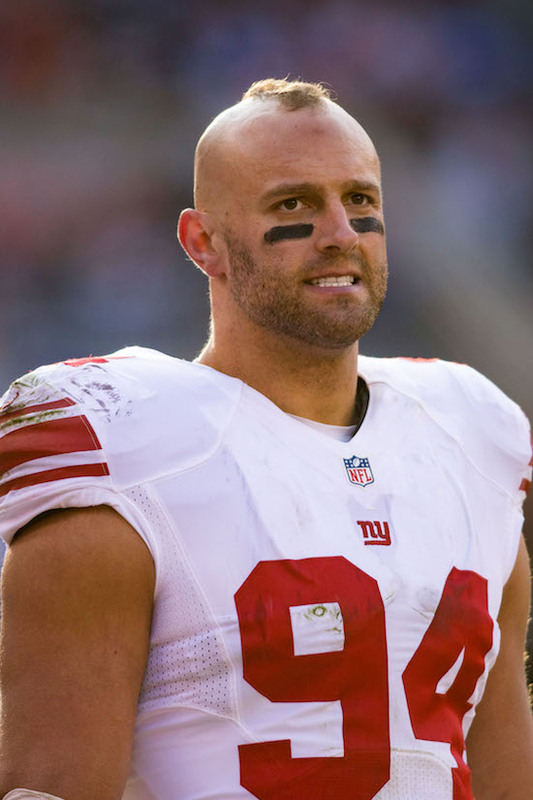 Q: What about Justin Pugh? A: Justin aggravated his back. He’s probably going to have to sit out a little bit. Q: How have the players been with self-motivating this year? What role do you have in that? A: Coaches and players get paid this week. But at the same point in time, to me, the best players and the best coaches are the people that are motivated intrinsically. Motivation does fall in my job description. If a player isn’t motivated, then I need to find a way to get him to play. The Giants’ 1-8 start is their worst since 1980, when they were also 1-8. This was the Giants’ first loss to a team with no wins and at least nine losses since November 20, 1966, when they fell to the 0-9 Atlanta Falcons, 27-16. The Giants have given up a touchdown to an opposing tight end in all nine games this season. Quarterback Eli Manning started his 208th consecutive regular-season game, tying his brother, Peyton, for the second-longest consecutive starts streak by a quarterback in NFL history. Eli Manning has started every Giants game since November 21, 2004. He has also started 12 postseason games, including two Super Bowls. The NFL record for consecutive starts by a quarterback is 297, was set by Brett Favre from 1992-2010 while playing for Packers, Jets, and Vikings. The players are off on Tuesday. The Giants return to practice on Wednesday in preparation of Sunday’s home game against the Kansas City Chiefs. Center Weston Richburg (concussion), guard John Jerry (tooth), linebacker Jonathan Casillas (neck), and linebacker Calvin Munson (quad) did not practice on Wednesday. Corner back Eli Apple (excused absence) also did not practice. Running back Paul Perkins (ribs), wide receiver Sterling Shepard (ankle), defensive end Olivier Vernon (ankle), and safety Landon Collins (ankle) practiced on a limited basis. Long snapper Zak DeOssie (wrist/elbow) fully practiced. 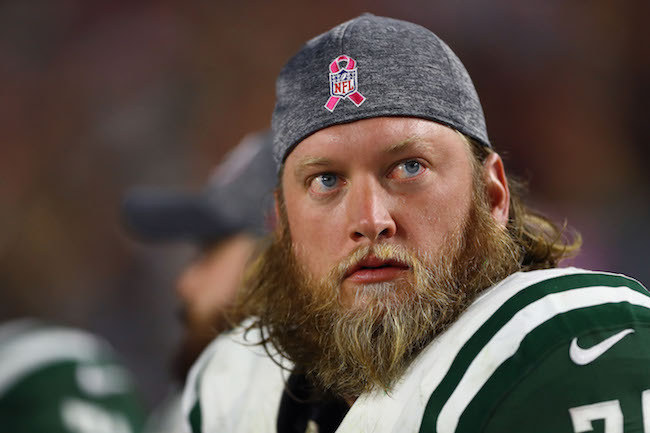 The Daily News is reporting that the New York Giants are interested in free agent offensive center Nick Mangold, who was released by the New York Jets in late February before free agency started. The 33-year old Mangold was originally drafted in the 1st round of the 2006 NFL Draft by the New York Jets. In his 11 seasons with the Jets, Mangold started every game he played in, missing only 12 games (eight of which were in 2016 due to an ankle injury). Mangold has been voted to seven Pro Bowls (2008-2011, 2013-2015) and is a three-time All-Pro (2009-2011). Though an aging veteran, Mangold is still capable of being a very effective run and pass blocker when healthy. Seattle Seahawks: The Giants play at Seattle if the Seahawks lose to the San Francisco 49ers on Sunday, regardless of whatever else happens. Green Bay Packers: The Giants play at Green Bay with a Green Bay win or tie AND a Seattle win or tie. Detroit Lions: The Giants play at Detroit with a Detroit win AND an Atlanta win or tie AND a Seattle win. Atlanta Falcons: The Giants play at Atlanta with an Atlanta loss AND a Seattle win AND a Detroit win. ESPN.com is reporting that defensive end Jason Pierre Paul, who had surgery to repair a sports hernia and his groin (core muscle) earlier this month, might return for the January 7th or 8th playoff game. There appears to be more confidence that he would be ready for the next playoff game if the Giants were fortunate enough to get past the first round. Pierre-Paul injured his groin in the team’s loss to the Pittsburgh Steelers on December 4th. The Tampa Bay Buccaneers have signed running back Russell Hansbrough off of the New York Giants Practice Squad. Safety Christian Bryant was also signed off of the Practice Squad by the Arizona Cardinals. The Giants signed quarterback Keith Wenning, running back Jacob Huesman, and safety Ryan Murphy to the Practice Squad. The Giants signed Hansbrough to the Practice Squad in December 2016. Hansbrough was originally signed as an undrafted rookie free agent by the Buccaneers after the 2016 NFL Draft. Hansbrough spent time on both Tampa Bay’s Practice Squad and 53-man roster before being cut in late November. Bryant was signed to the Practice Squad in late November. Bryant was originally drafted in the 7th round of the 2014 NFL Draft by the St. Louis Rams. The Rams waived him in September 2016. He then spent time on both the Practice Squad and active roster of the Arizona Cardinals. The Cardinals waived him in November. Bryant has played in 11 regular-season games with no starts. Wenning was originally drafted in the 6th round of the 2014 NFL Draft by the Baltimore Ravens. He has spent time with both the Ravens (2014-2015) and Cincinnati Bengals (2015). Wenning has decent size and a good arm with a quick release. He is not terribly mobile. Wenning is smart, hard-working, and tough. Huesman is a former quarterback who the Giants are converting to running back. He was not drafted in 2016, and not signed after the draft despite working out for the Steelers and Titans. Huesman had a brief stint with the Saskatchewan Roughriders of the CFL. He has good size for a running back and was productive in college running with the football as a quarterback. Murphy was originally drafted in the 7th round of the 2015 NFL Draft by the Seattle Seahawks. The Seahawks waived him in their final round of cuts in September 2015. He spent time on the Practice Squad of the Denver Broncos in both 2015 and 2016. Murphy has a nice combination of size and athletic ability. The Giants return to practice on Wednesday to prepare for Sunday’s game against the Washington Redskins. 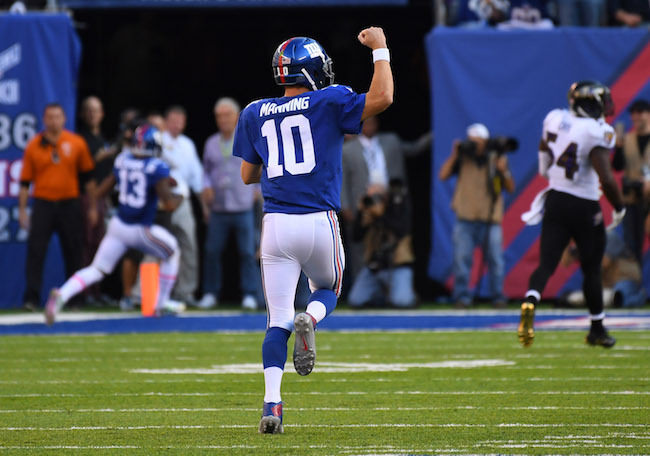 The New York Giants defeated the Baltimore Ravens 27-23 in a thrilling, often-ugly game at MetLife Stadium in East Rutherford, New Jersey on Sunday. With the win, the Giants evened their overall record to 3-3. 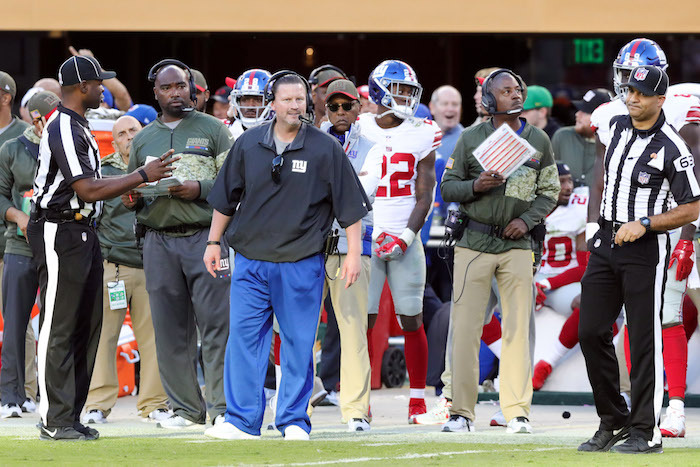 The Giants won the game despite a -3 turnover differential (2 interceptions, 1 fumble), being out-rushed 98 yards to 38, going 0-for-2 in the red zone, and badly losing the time of possession battle (24:56 to 35:04). Both teams were heavily penalized: Ravens 15 penalties for 111 yards and Giants seven penalties for 119 yards. The Giants started off poorly, quickly falling behind 10-0 as the Ravens drove 70 yards in 10 plays on their opening possession to set up a 23-yard field goal and then drove another 30 yards in six plays for a touchdown on their second drive after a Giants turnover. Meanwhile, the Giants offense sputtered, failing to pick up a first down until well into the 2nd quarter. Wide receiver Odell Beckham also fumbled the ball away on New York’s first offensive play. And the Giants punted the ball away on their next three offensive possessions after the turnover. The Giants defense settled down after Baltimore’s first two possessions. New York forced four consecutive punts during the remainder of the first half. The Giants finally got on the board late in the first half after driving 80 yards in 13 plays, culminating with a 24-yard touchdown strike from quarterback Eli Manning to wide receiver Roger Lewis, Jr. At halftime, the Ravens led 10-7. The Giants tied the game on their first possession of the 3rd quarter as New York marched 72 yards in 15 plays to set up a 21-yard field goal. This result was a bit disappointing, however, as the Giants had the ball at 1st-and-goal from the 1-yard line. After the Ravens punted the ball away for the fifth time in a row, Manning was intercepted and the Ravens returned the pick to the Giants 27-yard line. Baltimore could not pick up first down but they were close enough for a 39-yard field goal to retake the lead 13-10. That advantage was short-lived as Manning hit Beckham deep for a 75-yard touchdown catch-and-run on the Giants next offensive snap. This gave New York its first lead of the day, 17-13. The Ravens responded with a 70-yard deep pass from quarterback Joe Flacco to wide receiver Mike Wallace that set up Baltimore at the Giants 3-yard line. But New York’s defense responded with a goal line stand-and the Ravens were unable to score on 4th-and-goal. Coming off of the goal line, the Giants offense picked up one first down but then New York was forced to punt. The Ravens were able to drive 56 yards in seven plays – aided by a 42-yard pass interference call against cornerback Trevin Wade – to set up a 35-yard field goal to cut the Giants lead to 17-16 with 9:14 left to play. The Giants then extended their lead again after a 43-yard pass from Manning to Beckham helped to set up a 31-yard field goal with just under six minutes to go. All looked lost when the Ravens drove 75 yards in nine plays to set up a 2-yard touchdown run and take the lead 23-20 with just over two minutes to play. This touchdown was set up by a horrific officiating call when cornerback Dominique Rodgers-Cromartie was flagged with a 30-yard pass interference penalty on 3rd-and-4. Facing a 4th-and-1 at their own 34-yard line with 1:36 left to go, Manning hit Beckham over the middle and it was off to the races as Beckham scored from 66 yards out. The Giants now led 27-23. But the game was not over. With 1:19 left on the clock, the Ravens drove from their own 32-yard line to the Giants 24-yard line. They were aided by Beckham’s unsportsmanlike conduct penalty for taking his helmet off on the field of play after his touchdown. Then on 4th-and-5 from the Giants 39-yard line, defensive end Owamagbe Odighizuwa was flagged with roughing the passer on an incomplete pass that should have ended the game. But Flacco’s last three passes fell incomplete, with the last being defended by Rodgers-Cromartie in the end zone. Offensively, Manning finished the day 32-of-46 for 403 yards, 3 touchdowns, and 2 interceptions. Beckham caught eight passes for 222 yards and 2 touchdowns. The next leading receiver was tight end Larry Donnell with 6 catches for 34 yards. Running backs Rashad Jennings, Bobby Rainey, and Paul Perkins only generated 38 yards on 17 carries. Defensively, safety Landon Collins led the team with 12 tackles, 2 tackles for a loss, and 1 sack. Defensive tackle Johnathan Hankins had three tackles for a loss and a sack. Linebacker Jonathan Casillas had 11 tackles and stopped the 4th-and-goal play. Cornerback Dominique Rodgers-Cromartie was credited with three pass breakups. The Giants did not force a turnover. Inactive for the game were cornerback Eli Apple (groin), free safety Darian Thompson (foot), safety Nat Berhe (concussion), offensive tackle Marshall Newhouse (calf), wide receiver Tavarres King, linebacker Deontae Skinner, and quarterback Josh Johnson. The following Giants were injured in the game against the Ravens, but they all returned to the playing field: long snapper Zak DeOssie (ankle), wide receiver Odell Beckham (hip pointer), cornerback Trevin Wade (ankle), and linebacker Keenan Robinson (knee). DeOssie and Beckham were spotted limping pretty good after the game. “Whatever (the hip injury) is, it was bad. It was bothering me all game,” said Beckham after the game. The Giants became the third NFL franchise with 700 combined regular-season and postseason victories. They are 700-593-33 in their 92-year history. The Chicago Bears are 759-577-42 after their loss Sunday to Jacksonville. The Green Bay Packers were 754-569-37 entering their late-afternoon game vs. Dallas. QB Eli Manning played in his 191st regular-season game in a Giants uniform. That broke a tie with former wide receiver Amani Toomer, whose 13-year career ended in 2008. Manning is fourth on the franchise’s career list for games played. George Martin is third with 201. Manning’s record as a starter is 100-89. He is the 14th quarterback in NFL history with at least 100 regular-season victories. Manning is the sixth quarterback with at least 100 victories and two Super Bowl triumphs with the same team, joining Terry Bradshaw, Tom Brady, John Elway, Joe Montana and Ben Roethlisberger. Manning threw the game-winning pass to WR Odell Beckham with 1:24 remaining. It was the 31st time in the regular-season that Manning has led the Giants from a fourth-quarter deficit or tie to a victory. Manning today started his 200th game for the Giants (189 regular season, 11 postseason). He is the sixth quarterback in NFL history to start at least 200 games for one franchise, joining Elway (Denver), Brett Favre (Green Bay), Peyton Manning (Indianapolis), Dan Marino (Miami) and Brady (New England). Manning threw three touchdown passes. The first was the 300th of Manning’s splendid 13-year career; he became the eighth quarterback in history to throw for at least 300 scores. The second broke a tie with Pro Football Hall of Famer John Elway and moved Manning into sole possession of seventh place on the league’s career list. Beckham gained a career-high 222 yards. The 222 yards was the second-highest total in Giants history. It is exceeded only by Del Shofner’s 269 yards vs. Washington on October 28, 1962. Beckham has eight touchdown receptions of 50 or more yards, the NFL’s highest total since he entered the league in 2014. Beckham now has 17 career 100-yard games. That ties him with Homer Jones for third on the team’s career list, behind Toomer (22) and Victor Cruz (18).